9) American Adventure – Another very patriotic attraction can be found in the America Pavilion in Epcot’s World Showcase. 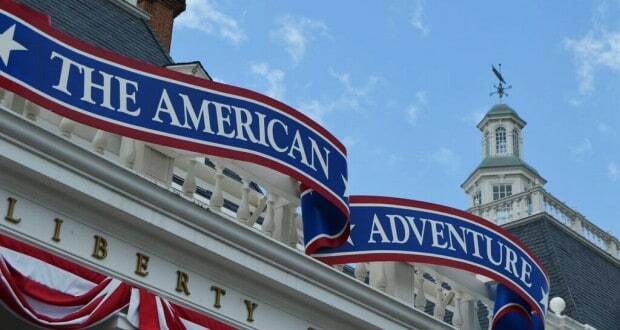 The American Adventure is similar to the Hall of Presidents in that it is a stage show that brings history to life through artwork, artifacts, and audio-animatronics, however this attraction tells the story of the American people. Guests can watch the progression of the people and their country from the pilgrims to modern times. There are poignant moments that showcase the struggles throughout the years like the Civil War in addition to moments of triumph. The amazing finale features the moving song “Golden Dreams” and an unveiling of the spirits of America as hosts Benjamin Franklin and Mark Twain look out over a sunset on a new day. While the American Adventure is a wonderful attraction, it is nearly a half hour long which eats up a lot of time that could be spent elsewhere in Epcot during a short Disney vacation.